The original forecast for today was for drizzle throughout, so it was pleasing to find the morning had dawned dull and quiet but fair. I met with John at the usual Homebase rendezvous in Alnwick to drive up to Bamburgh in the hope that the Bonaparte's Gull found earlier in the week would still be around. At this quiet, dark time of year it seemed the best option, and little did we know how good it would be. A few miles up the A1 John ordered a sharp right turn for a very brief detour to a concrete culvert ( a road really) under the main road to look for hibernating moths. It proved a good call with a single Herald roosting high on the roof right in the middle of the tunnel at its darkes spot. Back on to the trunk road North and we were soon at the very scenic tourist village of Bamburgh. 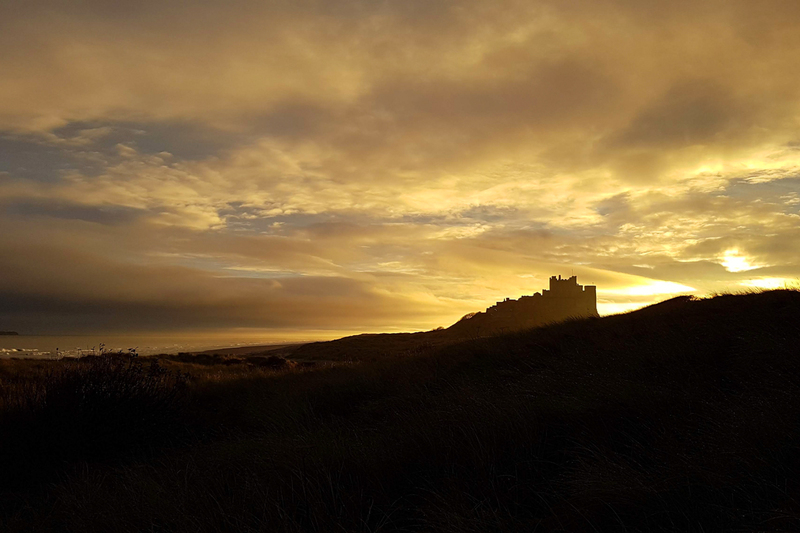 At all times, Bamburgh is still besieged by hordes more modern than the original vikings, so it was good to get there early doors before most were out. At first there were very few gulls to be seen on the shore but as the tide began to rise a few started to drop in. Eventually when we had added 120+ Purple Sandpipers and 130+ Shag to the notebook, our American target arrived with about 20 black headed gulls. 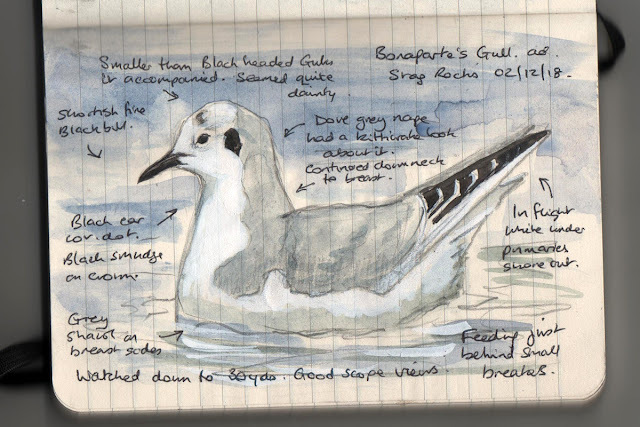 Its a while since Ive seen a Bonaparte's Gull so it was good to get this lovely, dove grey and white adult in winter plumage. 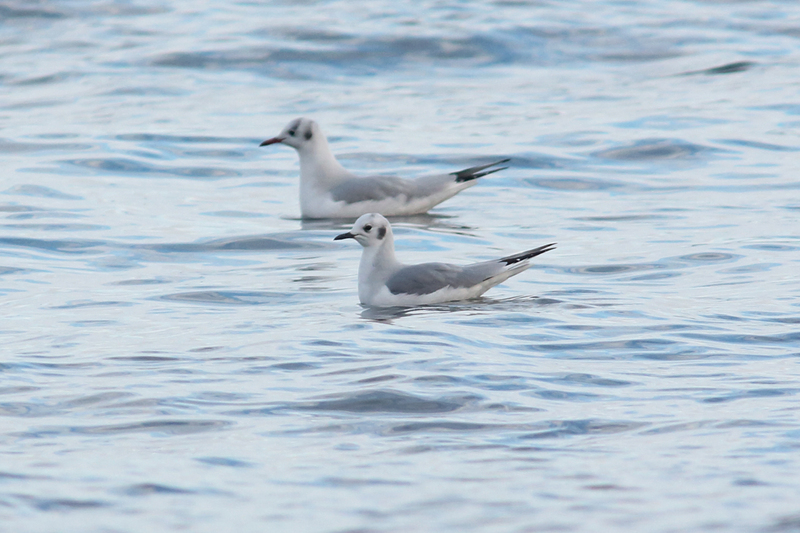 These are the Nearctic version of our common Black headed gull but seem so much daintier despite looking very similar. After giving it a good look at, we moved a few hundred yards up to the golf club entrance for a cuppa. While drinking tea we could view the flat calm water for seafowl in relative comfort. 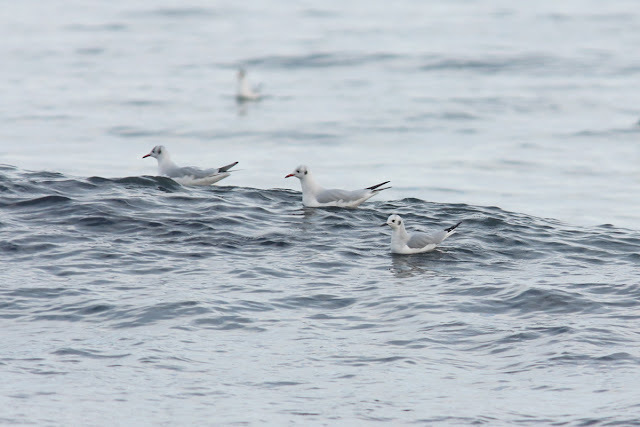 Things didnt look promising with only a few Common Scoter and Eiders dotted around, then a winter plumaged Puffin was a bit unusual at this time, diving at mid range. 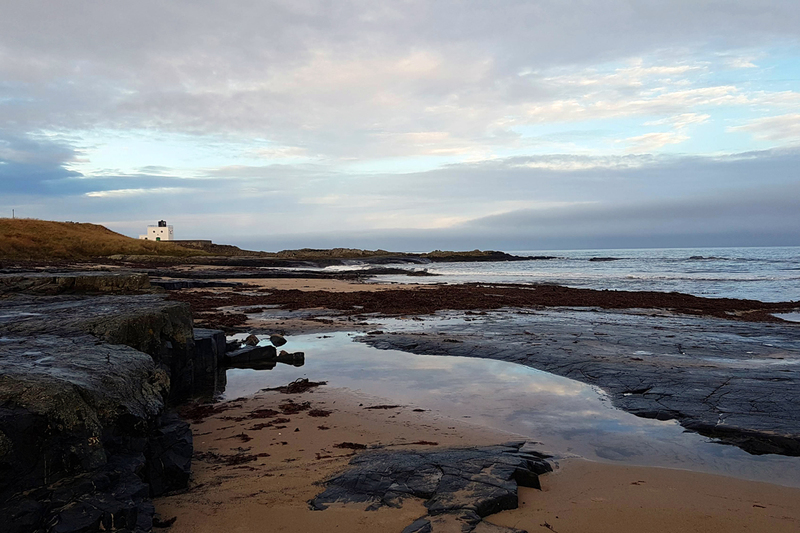 It was about now that John glimpsed a diver in front of the lighthouse and said 'Get a look at this'. As I looked in his scope I saw a split second before it submerged. It wasn't a red throated thats all I could see. After a long time, when it seemed to have succumbed to the depths, it emerged several hundred yards further offshore, for a minute then down again. 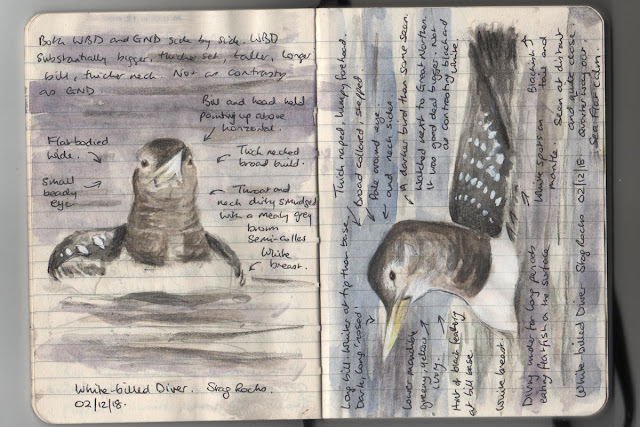 This time I commented that it was a large diver and the head posture was up tilted like a White billed, but it had gone. Another five minutes passed when it resurfaced, again too far out to tell. We grilled it and it stood up, flapped then dived. 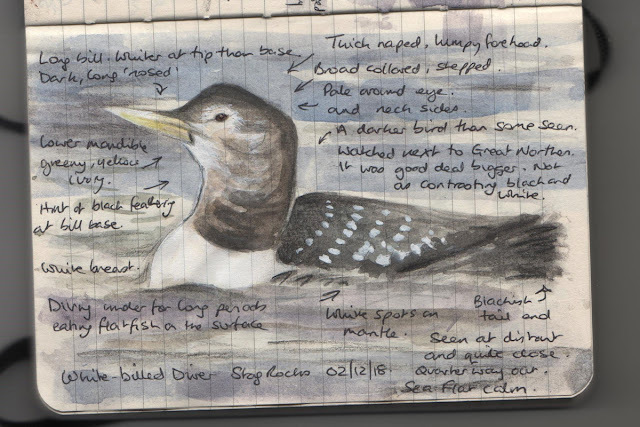 The bill seemed a bit scruffy and the nape looked very dark so we left it as a Great Northern. Then the phone rang. Jonathan Farooqi and his dad were at the lighthouse, maybe 2 or 300 yards closer to the bird. 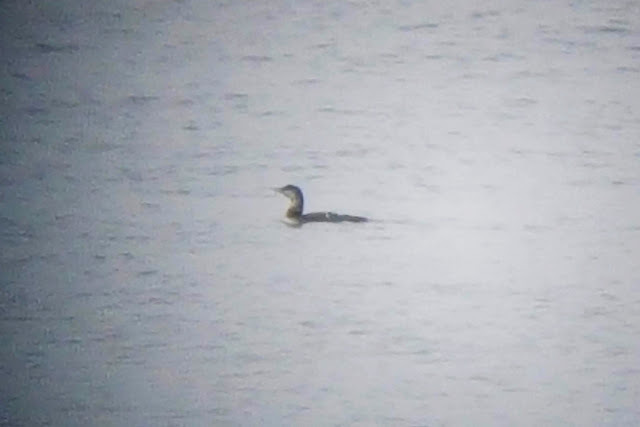 They were sure it was White billed Diver but it remained distant even for them. We hastily downed the tea dregs and walked down the slope to join them. 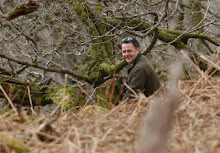 No sooner had we arrived, Jonathan offered me a look in his scope. There, a lot closer and heading our way was a big hefty White billed Diver! Get in! Not a bad day, twitching a Bonaparte's Gull then dipping in on a big banana bill, cant be bad. 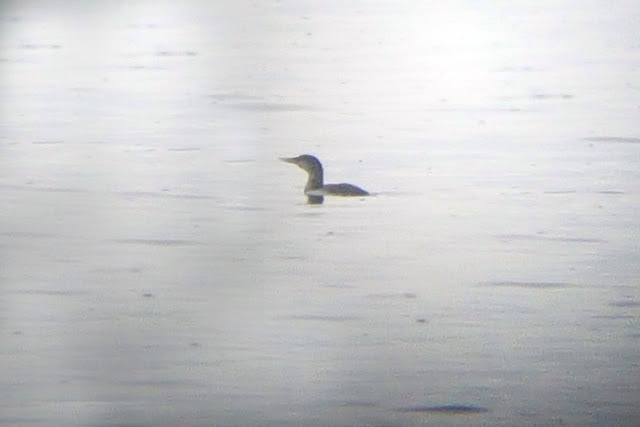 White billed Diver, adult winter.